Our new Communities issue on Communities and Climate Change will be mailed to subscribers on March 6. You can subscribe now or order a sample and we’ll ship you a copy today! 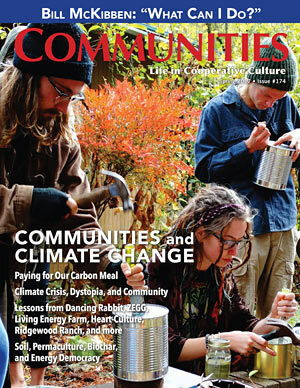 Our Spring issue examines how intentional communities and other groups are responding to the challenges presented by climate change. Through stories from more than a dozen diverse communities, we learn about steps being taken both to mitigate the intensity of climate disruption and to adapt to its effects. Innovative approaches include carbon onsetting, biochar production and use, personal/spiritual work, strategies for fossil-fuel-freedom, and more. Please join us! Articles Featured Online. The following articles from our current issue have been posted at our blog. Our Spring issue examines how intentional communities and other groups are responding to the challenges presented by climate change. Through stories from more than a dozen diverse communities, we learn about steps being taken both to mitigate the intensity of climate disruption and to adapt to its effects. Innovative approaches include carbon onsetting, biochar production and use, personal/spiritual work, strategies for fossil-fuel-freedom, and more.